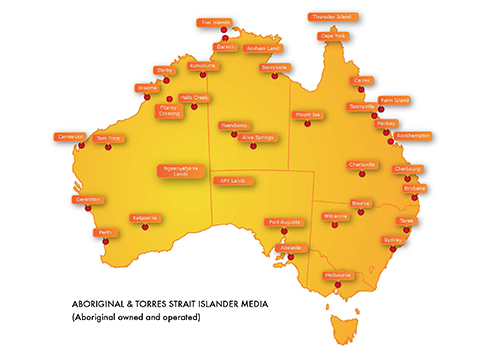 Aboriginal media is the medium through which Indigenous Australians are able to access, digitise and celebrate a dynamic and evolving culture, through story-telling, language, film and recordings. The medium empowers contemporary communities to reflect a strong culture. To hear new music, educate, give voice to community and reflect its views and people – Opportunities not available via any other media. Aboriginal and TSI Media takes a central role in reviving traditional languages. Language carries culture, so recording and capturing elders’ voices and stories is considered urgent. Some 25 languages in addition to English are broadcast: Alyawarr, Anindilyakwa, Anmatjerre, Burarra, Central Arrernte, Dhangu, Duhal, Gurrindji, Kalaw Lagaw Ya, Kriol (NT), Kimberley Kriol (WA), Kukatja, Kuuk Thaayorre, Luritja, Martu Wangka, Murrin Patha, Ngaanyatjarra, Noongar, Pitjantjatjara, Tiwi, TSI Kriol, Walmajarri, Wangkatha, Warlpiri, Western Arrernte, Wik Mungkan, Yankunytjatjara, Yolngu Matha.